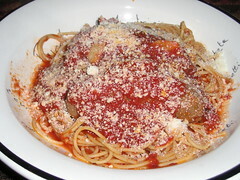 I had just been to Dolce & Clemente’s in Robbinsville, where I’d picked up sweet and hot Italian sausage (theirs is excellent), so I cooked that up with onions, adding the tomatoes and basil, and simmered it all for about 30 minutes. I haven’t cooked a red sauce dinner like that in ages, and it was delicious. The hot sausage was nicely spicy, the sweet had the fennel seeds I like so much (I think they have it with and without fennel, since people tend to have strong preferences on that). Mama mia those tomatoes were fantastic! p.s. I so wish we had Fresh Direct in this area, they have a lot of gourmet items, including prepared foods made with recipes from famous New York restaurants.